The new and improved STAINLESS STEEL Big City+ range offers high quality playground equipment with a unique appearance that ensures a contemporary, stylish and truly enticing addition to any recreational space. 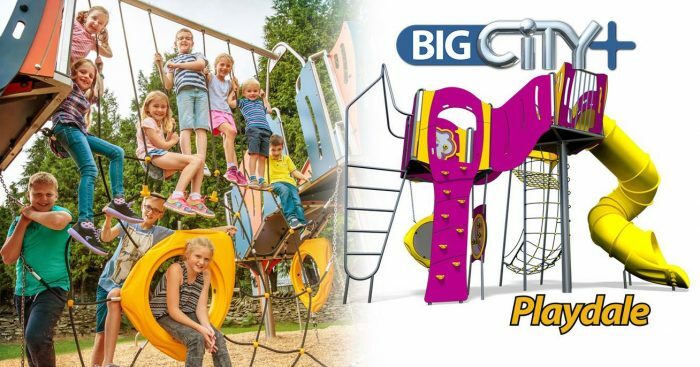 Exciting new features include the stunning 2.8m high Sky Tower, new activity panels and cleverly designed above and below deck features promoting maximum play value throughout. The range is fully modular with custom designed fixings and play features – from a simple single tower to a complex linked system and circuit of multiple towers and activities. Additional Inclusive models have been designed with both transfer and full wheelchair access to promote play for all abilities. Age appropriate climbing challenges, sliding, sensory panels, imagination play – and all out fun! The play possibilities are infinite and will meet the requirements for a wide range of situations and budgets. The Big City+ range complements our additional range of Little City Early Years playgrounds and Independents to create a balanced and stylish space.